5. Putting the Pieces Together: Where Do We Go from Here? Advances in Marine Biology has been providing in-depth and up-to-date reviews on all aspects of marine biology since 1963 -- over 45 years of outstanding coverage! The series is well-known for both its excellence of reviews and editing. 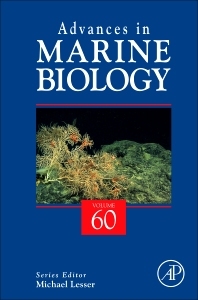 Now edited by Michael Lesser, with an internationally renowned Editorial Board, the serial publishes in-depth and up-to-date content on a wide range of topics that will appeal to postgraduates and researchers in marine biology, fisheries science, ecology, zoology, and biological oceanography. Advances in Marine Biology has been providing in-depth and up-to-date reviews on all aspects of marine biology since 1963 -- over 45 years of outstanding coverage! Lesser MP. Using Energetic Budgets to Assess the Effects of Environmental Stress on Corals: Are We Measuring the Right Things? Coral Reefs, 32: 25-33, 2013. Brazeau, D., M. P. Lesser, and M. Slattery. Genome-wide Sampling of Genetic Structure in the Coral, Montastraea cavernosa: Assessing Population Connectivity Among Mesophotic Reefs. PLoS ONE, 8(5): e65845, 2013. Lesser, M. P., Stat, M., and R. D. Gates. The Endosymbiotic Dinoflagellates (Symbiodinium sp.) of Corals Are Parasites and Mutualists. Coral Reefs, 32: 603-611, 2013. Fiore, C. L., Baker, D. M., and M. P. Lesser. Nitrogen Biogeochemistry in the Caribbean Sponge, Xestospongia muta: A Source or Sink of Dissolved Inorganic Nitrogen? PLoS ONE, 8: e72961, 2013. Fiore, C. L., Jarett, J. K., Labrie, M. S., and M. P. Lesser. Symbiotic Prokaryotic Communities from Different populations of the Giant Barrel Sponge, Xestospongia muta. MicrobiologyOpen, doi: 10.1002/mbo3.135, 2013. Olson, N. and M. P. Lesser. Diversity of Nitrogen Fixing Bacteria Associated with Different Color Colonies of the Coral, Montastraea cavernosa. Archives of Microbiology, doi: 10.1007/s00203-013-0937-z, 2013. Lesser, M. P. and M. Slattery. Ecology of Caribbean Sponges: Are Top-down or Bottom-up Processes More Important? PLoS ONE, 8: e79799, 2013. Lesser, M. P., Carleton, K. L., Böttger, S. A., Barry, T. M. and C. W. Walker. Sea Urchin Tube Feet are Photosensory Organs that Express a Rhabdomeric-like opsin and PAX6. Proceedings of the Royal Society: Biological Sciences, doi: 10.1098/rspb.2011.0336, 2011. Lesser, M. P., and M. Slattery. Invasive Lionfish Causes a Phase Shift to Algal Dominated Communities at Mesophotic Depths on a Bahamian Coral Reef. Biological Invasions, 13: 1855-1868, 2011. Lesser, M. P. Coral Bleaching: Causes and Mechanisms. In: Coral Reefs: An Ecosystem in Transition, Dubinsky, Z. and N. Stambler (eds. ), Springer, pp. 405-420, 2011. Fiore, C. L., Jarett, J. K., Olson, N. D., and M. P. Lesser. Nitrogen Fixation and Nitrogen Transformations in Marine Symbioses. Trends in Microbiology, 18: 455-463, 2010. Lesser, M. P., M. Bailey, D. Merselis, and J. R. Morrison. Physiological response of the blue mussel Mytilus edulis to differences in food and temperature in the Gulf of Maine. Comparative Biochemistry and Physiology A, 156: 541-551, 2010. Lesser, M. P., M. Slattery, M. Stat, M. Ojimi, R. Gates, and A. Grottoli. Photoacclimatization by the Coral Montastraea cavernosa in the Mesophotic Zone: Light, Food, and Genetics. Ecology, 91: 990-1003, 2010. Banaszak, A. T. and M. P. Lesser. Effects of Ultraviolet Radiation on Coral Reef Organisms. Photochemical and Photobiological Sciences, 8: 1276-1294, 2009. Lesser, M. P. Slattery, M., and J. J. Leichter. Ecology of Mesophotic Coral Reefs. Journal of Experimental Marine Biology and Ecology, 375: 1-8, 2009. Blakeslee, A. M. H., Byers, J. E., and M. P. Lesser. Resolving cryptogenic histories using host and parasite molecular genetics. Molecular Ecology, 17: 3684-3696, 2008. Lesser, M. P. Coral Reefs Bleaching and Global Climate Change: Can Corals Survive the Next Century? Proceedings of the National Academy of Sciences, 104: 5259-5260, 2007. Bou-Abdallah, F., Chasteen, N. D., and M. P. Lesser. Quenching of Superoxide Radicals by Green Fluorescent Protein. Biochimica et Biophysica Acta (General Subjects) 1760:1690-1695, 2006. Lesser, M. P. Oxidative Stress in Marine Environments: Biochemistry and Physiological Ecology. Annual Reviews of Physiology, 68: 253-278, 2006. Lesser, M. P., Mazel, C. M., Gorbunov, M. Y., and P. G. Falkowski. Discovery of Symbiotic Nitrogen-Fixing Cyanobacteria in Corals. Science, 305: 997-1000, 2004. Lesser, M. P. Experimental Coral Reef Biology. Journal of Experimental Marine Biology and Ecology, 300: 217-252, 2004. Lesser, M. P. Exposure of Symbiotic Dinoflagellates To Elevated Temperatures and Ultraviolet Radiation Causes Oxidative Stress and Inhibits Photosynthesis. Limnology and Oceanography, 41: 271-283, 1996. Cullen, J. J, P. J. Neale, and M. P. Lesser. Biological Weighting Function for the Inhibition of Phytoplankton Photosynthesis by Ultraviolet Radiation. Science, 258:646-650, 1992.